…licks does it take to get to the center of a Tootsie Pop? As a child I was never patient enough to find out and as a grown (or in this case, growing) adult I don’t care. What I am curious about is how many glasses of juice it will take to consume a 10 lb. bag of carrots. You see in the past six months I have put on the poundage, but it’s not my fault! I totally blame menopause. At first I thought I might have some kind of thyroid problem, but then Dr. Google told me otherwise. Apparently hormones and weight gain are closely related. It makes sense, until I start thinking about how I should at least be losing the water weight with all the hot flashes and night sweats. So I have decided (because the mirror keeps screaming at me) that I need to diet. Oh, and exercise; except it’s really hard to do push ups with a cigarette in my mouth and I keep spilling my beer when I do arm curls. Anyweight, today was the first day of diet and exercise. I was ready to start a month ago, but then Paul came home for three weeks and it was just too hard. There he was, wanting to eat all the things that aren’t available to him in India and how do I say no? Not to him, but to me. Smoked ribs on the grill; fillet with béarnaise sauce; roasted turkey; mashed potatoes with gravy; chicken rolls filled with spinach, prosciutto and provolone with white wine sauce; biscuits and gravy; bacon and…more bacon. Yeah, hard to say ‘no’. …thus the 10 lb bag of carrots. How many glasses will it take? You could consider doing your arm curls with a six pack in each hand, right? Unfortunately I am accustomed to buying it by the case. My flapping arms couldn’t handle that! I'm gonna guess at about 15 glasses. Load 'em up baby! keep up the good work. The first week is the hardest. I'm 5 months in and still struggling. Dude. Melissa and I were just debating that whole tootsie pop issue the other day! Also, I want a juicer so bad. AND you should do P90X with me! For realz. PS : You should ask your woman doctor for meds because that will help even out the hot flashes and weight gain and crap. Why did I not think to tell you this before. I'm going to say 10 glasses of juice... assuming that your glasses are 8-oz glasses, of course. 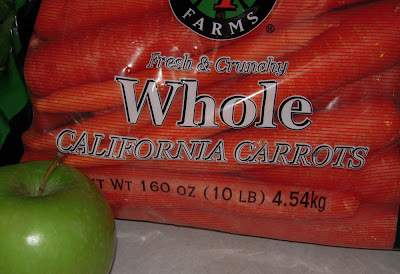 And assuming that I estimate that one pound of carrots makes about eight ounces of juice. Don't drink too much, though. You might wind up looking like you belong on "Jersey Shore".